Here are some of the open books I have on my Kindle (why yes, they are Kindle books!). The U.S. Navy's patrol of the Yangtze River began in 1854 when the USS Susquehanna was sent to China to safeguard increasing American commerce in the region. 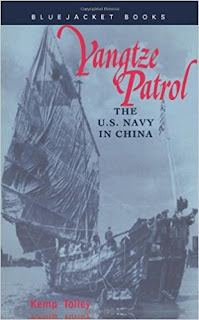 As Kemp Tolley explains in this entertaining history of the patrol in which he was to later serve, the presence of gunboats along the river greatly benefited the integrity of the shoreline factories. Tolley was a young naval officer in the 1930s when assigned gunboat duty, first in the Mindanao, then in the Tutuila, and finally the Wake in August 1941. His colorful description of life as a "river rat" is filled with anecdotes about the resourceful and high-spirited sailors who manned the old riverboats in that distant land. History, politics, and a sympathetic eye for the plight of the Chinese people - well written and an interesting read. Western Front, the overall shape of the war arose out of its maritime character. It was essentially a struggle about access to worldwide resources, most clearly seen in Germany’s desperate attempts to counter the American industrial threat, which ultimately drew the United States into the war. This radical new book concentrates on the way in which each side tried to use or deny the sea to the other, and in so doing describes rapid wartime changes not only in ship and weapons technology but also in the way naval warfare was envisaged and fought. 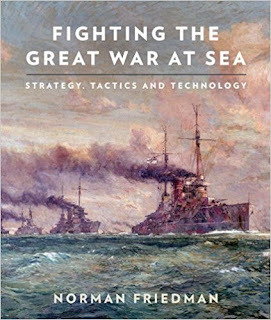 Melding strategic, technical, and tactical aspects, Friedman approaches the First World War from a fresh perspective and demonstrates how its perceived lessons dominated the way navies prepared for the Second World War. 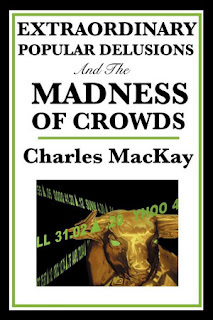 Extraordinary Popular Delusions and the Madness of Crowds is an early study of crowd psychology by Scottish journalist Charles Mackay, first published in 1841. The book chronicles its subjects in three parts: "National Delusions", "Peculiar Follies", and "Philosophical Delusions". MacKay was an accomplished teller of stories, though he wrote in a journalistic and somewhat sensational style. The subjects of Mackay's debunking include alchemy, crusades, duels, economic bubbles, fortune-telling, haunted houses, the Drummer of Tedworth, the influence of politics and religion on the shapes of beards and hair, magnetisers (influence of imagination in curing disease), murder through poisoning, prophecies, popular admiration of great thieves, popular follies of great cities, and relics. Present-day writers on economics, such as Michael Lewis and Andrew Tobias, laud the three chapters on economic bubbles. Scientist and astronomer Carl Sagan mentioned the book in his own discussion about pseudoscience, popular delusions, and hoaxes. Yes, it's an "early study," but it's a good one.